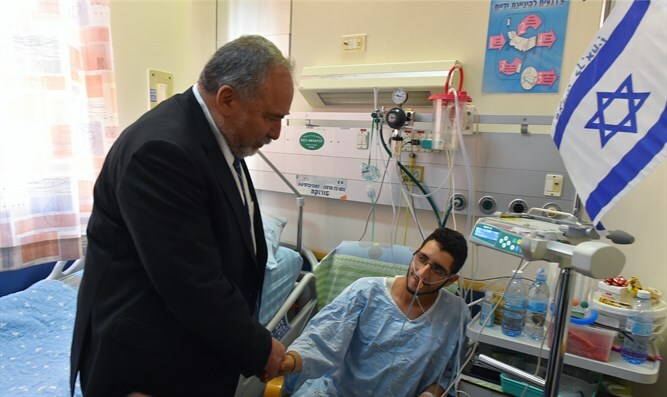 Defense Minister Avigdor Liberman this morning, Sunday, visited at Soroka hospital in Be’er Sheva IDF officer Bar Vaknin, who was wounded last week by terrorist fire at the Gaza Strip border. Liberman promised Lieutenant Vaknin and his parents, who are at his bedside in the hospital, that the IDF would reach the terrorist and bring him to justice. "In the end, the IDF reaches everyone. As we promised the family of Ronen Lubarsky, of blessed memory, that we will exact justice against the one who harmed him, this time, as well, we will reach the terrorist and close the account with him," Liberman said. The officer was hit by a sniper at the Gaza Strip border on Wednesday evening and his condition was defined as moderate. Later, his condition improved somewhat. A military source said the incident took place when a military force encountered a disturbance of children under whose protection a sniper fired at the soldiers. The incident took place several hundred yards from the spot where Staff Sergeant Aviv Levi was shot and killed by a Hamas sniper nine days ago. This incident caused a significant escalation in the area, followed by a Hamas-initiated ceasefire.